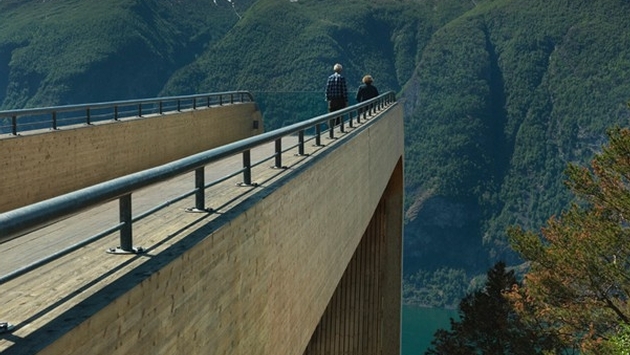 The view from Aurland Lookout in the Sogn og Fjordane region of Norway is picturesque, stunning and downright terrifying. The Huffington Post’s Kate Auletta spotted some captivating images from a lookout that is designed to drop jaws and trigger a new appreciation for gravity. Thankfully, far more information and photographs can be found at Saunders Architecture, the firm responsible for the destination hot spot. Among some stunning images, the website states Todd Saunders and Tommie Wilhelmse designed the precipice, which won first prize in an unnamed competition back in 2002. However, as Auletta reports, work on the edifice wasn't completed until 2006. Now you only need to see some of the YouTube videos to truly appreciate how something so simplistic can trigger a wave of reactions. Indeed it does, reminding us all in a wave that beauty can be found from all corners of the globe. You just have to find the right vantage point to truly capture an awe-inspiring image. When one doesn’t exist, you build it and watch the tourists arrive in droves.